Can Teething Cause Loss of Appetite? Children usually start teething between 4 to 7 months, and they usually have all 20 baby teeth by the time they are 3 years old. During this time, you might notice that your little one experiences a variety of symptoms each time a tooth erupts. While the symptoms present aren't the same for every child, there are some symptoms that are considered common. One of these symptoms is a reduction in the amount of food your child eats. The change in your baby's appetite is due to the discomfort or pain of teething. Your baby's gums become inflamed and sore as the tooth pushes on the gum. The pressure of the tooth pushing against the gum can make your baby's mouth hurt. Once your child's mouth starts to hurt, she may not want to eat any food because she is bothered by the discomfort. Symptoms associated with teething start an average of four days prior to the tooth coming in, and they continue for approximately three days after, according to a study published in "Pediatrics." 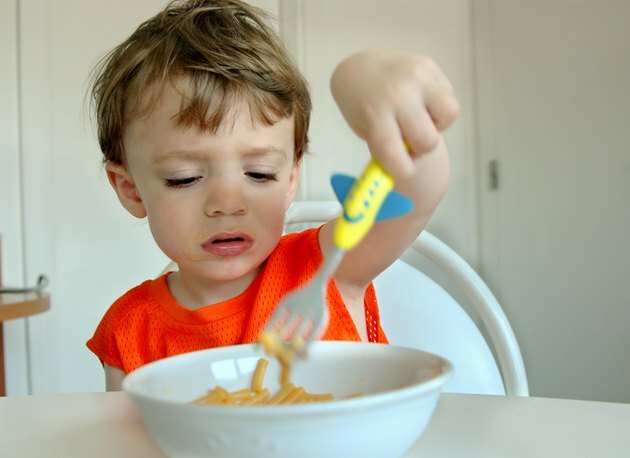 While it isn't likely that your child will stop eating for this entire time, he may stop eating for one or more feedings. If he refuses food for several feedings in a row, contact his pediatrician to find out if an office visit is necessary. Be sure that your child is drinking fluids during this time to prevent dehydration. If your child isn't eating solid foods yet, contact a doctor if your baby is eating significantly less for one day. A child who isn't eating normally may become cranky. This is usually because the child is experiencing hunger pains and can be because her blood sugar has dropped. This crankiness can lead to crying, which puts pressure on the head and may cause the gums to hurt worse. As the pain in the gums increases, the child may not want to eat because of the pain, and the viscous cycle continues until the pain is controlled and the child eats. Making sure that your child stays hydrated is vital, as dehydration will make your child feel worse and may necessitate a trip to the doctor or hospital. Pediatric electrolyte replacement solutions may help to keep your little one hydrated. Oral pain relievers, such as acetaminophen, may help to control your child's pain, so he will eat. Talk to the pediatrician to find out what medication and what dosage is right for your child. In severe cases, your doctor may suggest that your child drink high-calorie meal replacement beverages.